The Pinnacle Vinyl & Glass Clean & Protect Combo is the perfect grouping of products that will keep your interior looking showroom new. This indispensable combo features the cleaning power of Pinnacle Vinyl & Rubber Cleaner & Conditioner and Pinnacle Crystal Clear Glass Cleaner with Rain Repellant along with the corresponding towels for proper use. The Pinnacle Vinyl & Glass Clean & Protect Combo provides a quick an easy solution for keeping interior surfaces and glass clean�it�s the perfect combo to keep in your trunk for keeping things neat and tidy while on the go! 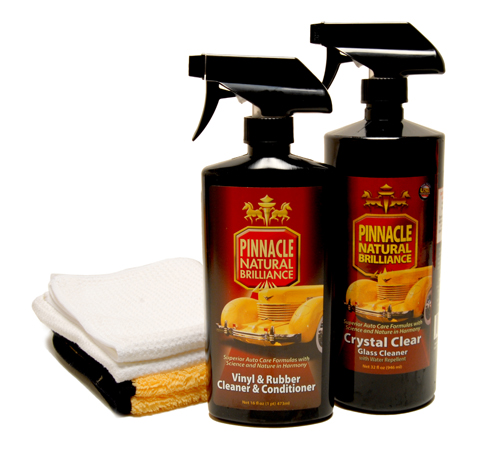 Pinnacle Vinyl & Rubber Cleaner & Conditioner is an all-in-one interior product that cleans and protects many of the surfaces inside your vehicle. This unique formula is gentle enough for use on delicate surfaces, yet maintains the cleaning power to eliminate unsightly dirt and grime. Pinnacle Vinyl & Rubber Cleaner & Conditioner helps maintain the like new look and feel of the vinyl and rubber surfaces in your vehicle. Every time you wash your glass with Pinnacle Crystal Clear Glass Cleaner with Water Repellent, you are creating a safer driving experience in your automobile. The safety of you and your automobile depends on your ability to see. Pinnacle Crystal Clear Glass Cleaner with Water Repellent is a spray-on cleaner that removes road film, oil, grime, dirt, and bug residue. It also imparts a hydrophobic coating that repels water. Your glass will be streak-free and clear in the sun and your vision will remain clear in inclement weather. The Gold Plush Jr. Microfiber Towel is made of incredibly soft and plush microfiber in a handy 16 x 16 inch size. It's perfect for quick detailing and pampers every surface it touches. The Gold Plush Jr. Microfiber Towel measures 16 x 16 inches and features an outstanding 75/25 blend of polyester and polyamide. The microfiber�s weight is 380 g/m�, making one very soft towel! This kit has a total retail value of $71.96 saving you $32.96!